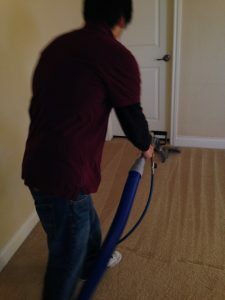 When it comes to carpet cleaning San Antonio most professionals and customers prefer steam cleaning. Steam cleaning is a form of carpet cleaning which uses extremely hot water to sanitize and clean carpets, tile, and upholstery. Steam cleaning is effective and in most cases cheaper than the alternative. There are 3 forms of carpet cleaning. The first is what most people uses because it is cheaper; however, is less effective, that is renting a shampooer from your local grocery store or supplier. 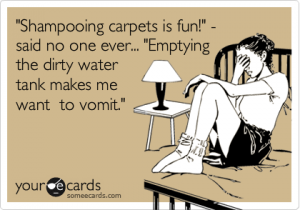 Shampooing your carpets yourself is not only a lot of work but can ruin your carpets. Shampoo leaves residue in your carpet that can stiffen the carpet and it also attracts dirt so your carpet will become dirty quicker. The second option is chemical carpet cleaning. Cleaning with chemicals is the latest fad in carpet cleaning. It is effective to a certain point for some but for others it is not effective. Cleaning with chemicals instead of steam means that the chemicals are only touching the surface of your carpets. It does not get below to kill anything that might be within the fibers of your carpet. Also, it could have an adverse effect on your carpet and ruin it. Chemicals are risky and more expensive then any other type of carpet cleaning. The third option is steam cleaning. Steam cleaning is not only effective but cheaper then most options. Professional carpet cleaners that use truck mounted steam cleaning machines steam clean at 200 degrees or higher. This means that they are able to kill allergens and dust mites and the steam is able to get within the fibers to reach everything. When steam cleaning most carpet cleaners use solvents that are safe for everyone. The solvents will remove spots and stains. The only down side to steam cleaning is that it leaves the carpets wet or damp. It usually takes 5-7 hours to dry (in rare cases 24 hrs); however, waiting hours to dry can put your carpet at risk for mold and mildew but the chances of that happening is slim. 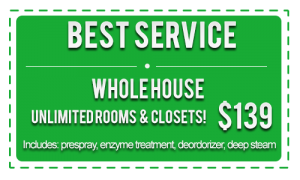 Beyer Carpet Cleaning uses the steam cleaning method because it is so effective and because they can keep their costs low. For a carpet cleaning with solvents they only charge $139.99. This is for unlimited rooms, halls, and closets up to 2,000 square feet of carpet. So good old school and steam clean your carpets and call Beyer Carpet Cleaning.